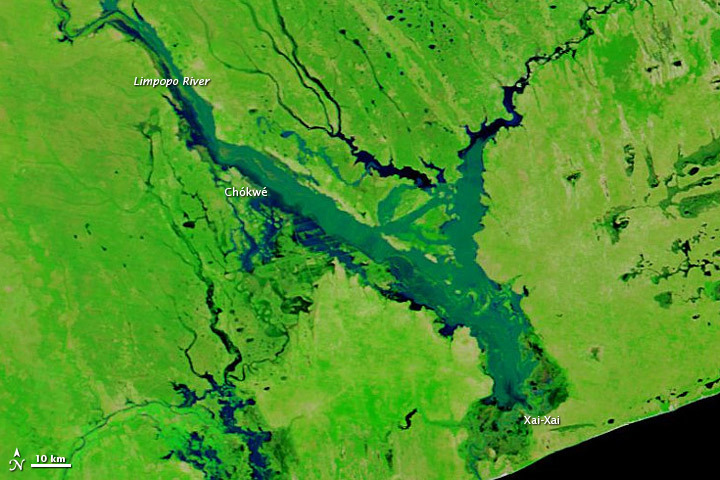 In a little over two weeks, heavy rains transformed the landscape of southern Mozambique. 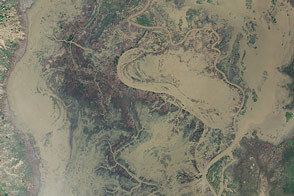 On January 9, 2013, the lower Limpopo River was barely discernible from the sky. By January 25, the river had spilled over its banks, with water spreading more than 10 kilometers (6 miles) across the landscape in places. 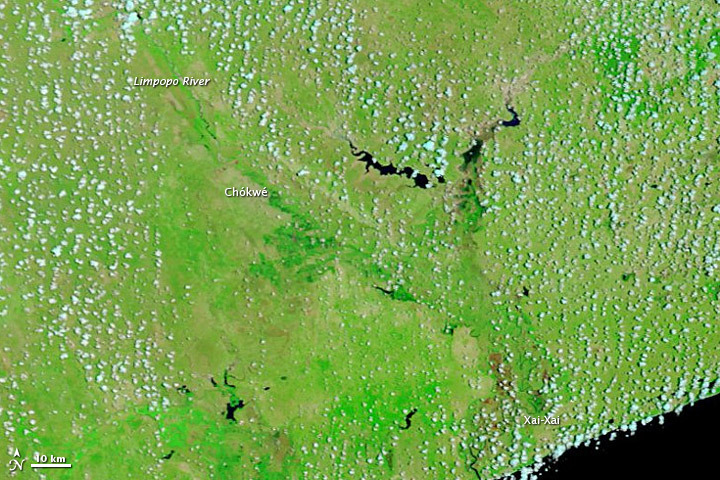 The Moderate Resolution Imaging Spectroradiometer (MODIS) on NASA’s Terra satellite captured these images on January 25, 2013 (top), and January 9, 2013 (bottom). Both images use a combination of visible and infrared light to better distinguish between water and land. Water ranges in color from navy blue to teal. Vegetation is bright green. Clouds are pale blue-green and cast shadows. On January 25, the BBC reported that roughly 85,000 people had been affected by flooding, about 65,000 of them in the southern Mozambique province of Gaza. 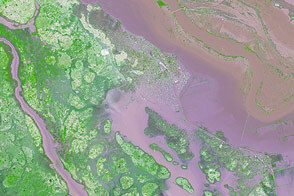 The city of Chókwé was among the worst-hit, and the United Nations warned that the number of people affected could reach 100,000 if flooding worsened in the coastal city of Xai-Xai. On January 27, Al Jazeera reported a higher number of residents displaced by the flooding: nearly 300,000. A reporter from Agence France-Presse reported seeing tens of thousands of Mozambique residents camped along roadsides. 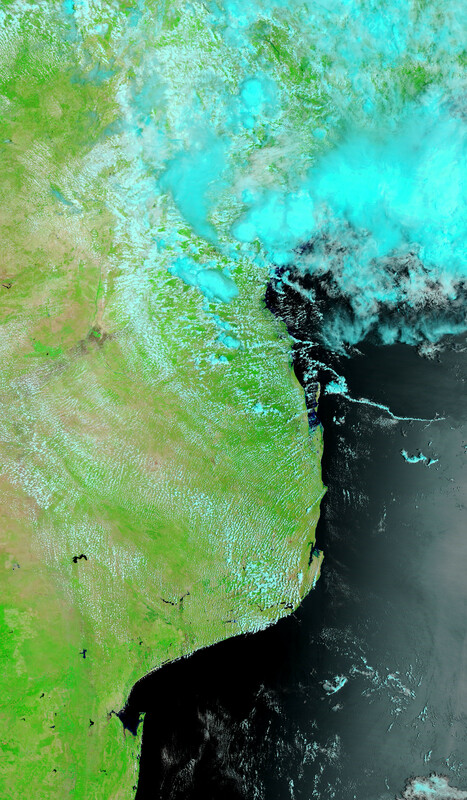 Flooding was not confined to Mozambique. It also affected Zimbabwe, Botswana, and South Africa. In South Africa, flooding had forced the operators of a crocodile farm to open the gates, releasing approximately 15,000 crocodiles, the BBC said. 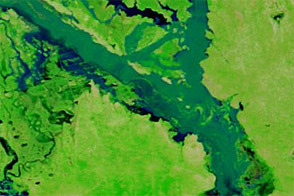 NASA images courtesy LANCE MODIS Rapid Response. Caption by Michon Scott. 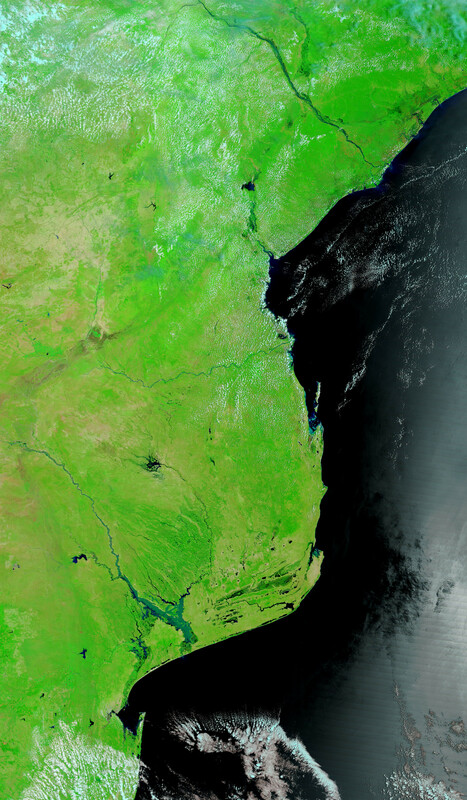 In a little over two weeks, heavy rains transformed the landscape of southern Mozambique. 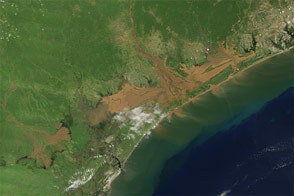 In January 2013, severe flooding struck Mozambique, Zimbabwe, Botswana, and South Africa. BBC. (2013, January 25) UN: Floods displace 70,000 and kill 36 in Mozambique. Accessed January 28, 2013. 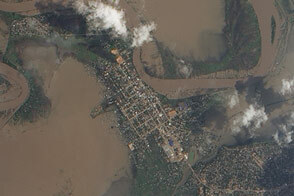 Mutasa, H. (2013, January 27) “Dire situation” after Mozambique floods. Al Jazeera English. Accessed January 28, 2013.